China is currently developing relatively low-cost "smart" unmanned submarines that can perform a wide variety of tasks, from surveillance to the placement of munitions and "suicide" attacks, reports the South China Morning Post. The unmanned subs are part of Beijing's ambitious plan to enhance its country's naval power with AI technology in order to challenge Western naval superiority in regions like the South China Sea and western Pacific Ocean, while the first autonomous robotic drones expected to be deployed in the early 2020s. The project is part of the government's ambitious plan to boost the country's naval power with AI technology. China has built the world's largest testing facility for surface drone boats in Zhuhai, Guangdong province. Military researchers are also developing an AI-assisted support system for submarine commanders. As the South China Morning Post reported earlier this year, that system will help captains make faster, more accurate judgments in the heat of combat situations. The AI-enhanced subs will "go out, handle their assignments and return to base on their own," reports SCMP, while establishing periodic contact with ground command as needed. The subs will eventually be able to station themselves for ambushes at geographical "chockpoints" where enemy ships are likely to travel, while also being able to work with manned submarines to scout, or as decoys to draw fire and expose an adversary's position. An AI sub “can be instructed to take down a nuclear-powered submarine or other high-value targets. It can even perform a kamikaze strike,” said the researcher, in reference to Japanese WWII fighter pilots. “The AI has no soul. It is perfect for this kind of job,” the researcher added. Luo Yuesheng, professor at the College of Automation in Harbin Engineering University, a major development centre for China’s new submarines, contended that AI subs would put the human captains of other vessels under enormous pressure in battle. The subs do have limits - for now, so they are beginning with relatively simple tasks while final decisions are all made by human beings, according to Chinese military researchers. That said, they'll be huge compared to normal UUVs, according to the report. Lin Yang, marine technology equipment director at the Shenyang Institute of Automation, Chinese Academy of Sciences, confirmed to the South China Morning Post this month that China is developing a series of extra-large unmanned underwater vehicles, or XLUUVs. The institute is a major developer of underwater robotics for the Chinese Military - having developed Beijing's first autonomous underwater vehicle with an operational depth beyond 3.7 miles. Yang is now the chief scientist of China's "912 Project," a classified program to develop the country's underwater military robots in time for the 100-year anniversary of the Chinese Communist party in 2021. “It will be announced sooner or later, but not now,” he added. Not to be outdone in size or girth, the US military announced as major defense contract last year for two prototype XLUUVs by 2020. “A critical benefit of Orca is that Navy personnel launch, recover, operate, and communicate with the vehicle from a home base and are never placed in harm’s way,” the company said in an announcement. Unsurprisingly, Lockheed did not respond to the South China Morning Post's requests for information on Orca's size and operational endurance. 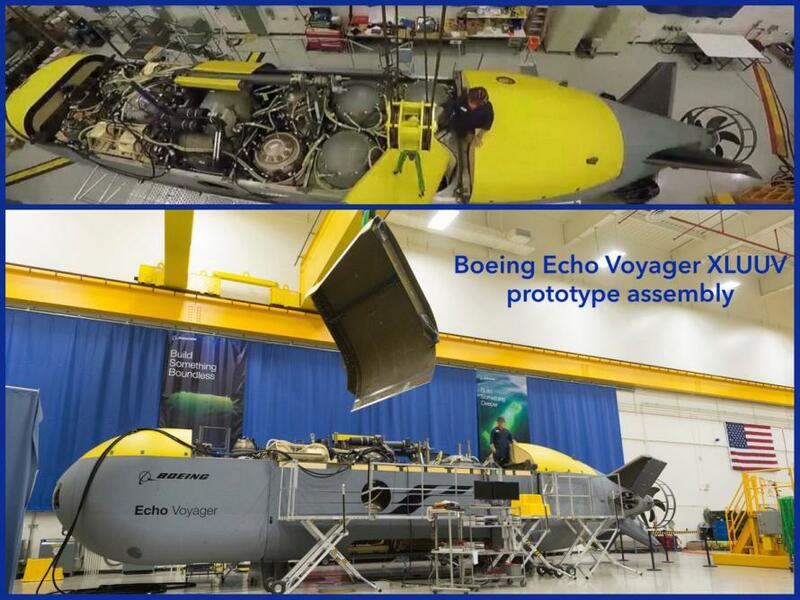 Boeing, meanwhile, is developing the other prototype - its "Echo Voyager," a 50-ton autonomous sub first developed for commercial purposes such as mapping the ocean floor. The approximately 50 foot vehicle just 8.5 feet in diameter can operate for months over a range of around 7,500 miles - enough to sail from San Francisco to Shanghai at 8 knots. Russia has also reportedly developed a large underwater drone able to carry a 100-megaton warhead - the Status-6 autonomous torpedo. China's announcement comes seven months after US officials say China unlawfully seized an unmanned underwater US Navy vehicle in international waters in the South China Sea. According to CNN, a US oceanographic vessel had its underwater drone stolen by a Chinese warship literally right in front of the eyes of the American crew.